An old college room mate from back East sent me a news link he knew I would appreciate. The article notes the migration of the Hasidim (Orthodox Jews) from the town of Lakewood, New Jersey to an upscale neighborhood in the adjacent town of Toms River. This has stirred up resistance among the existing population who don’t appreciate their new Hasidic neighbors. The overwhelming purpose of a 5,000+ square foot home on a large lot is to display wealth and status. In spite of their large size most of these homes are only occupied by three or four people. These homes announce that the owners have achieved something special in life and can afford an impressive lifestyle. Everything about these properties reflects the concept of leisure and exclusivity. It’s all a conspicuous display of resources that are intentionally not being turned to productive activity. The Hasidim live apart from modern society, reject corrupting outside influences, and value family and community above materialism. They adhere to a strict segregation of the sexes, marry young, and have unusually large numbers of children which attend private religious schools. Unlike secular Jews they rarely attend university or seek employment outside their immediate community. Think of them as a cross between the Amish and Mormons. So here’s the problem. The Lakewood/Toms River area has seen exponential population growth in recent years, almost all of it Hasidic. And they inhabit their homes in a way that disrupts suburban sensibilities. Observant Jews are forbidden to operate machinery or conduct business on the Sabbath. Consequently they live in tight knit communities within walking distance of Temples, Yeshivas (religious schools), and extended family. In an urban environment everyone walks everywhere and it’s perfectly normal for buildings to house more than one family and for residential and non residential activities to coexist in the same structure. The Hasidim have adapted to the suburban landscape by taking large single family homes and occupying them as if they were small city apartment buildings with ground floor shops. Why not conduct religious services in the grand living room ? Why not convert the three car garage to extra bedrooms for the kids? Why not operate a home business in the bonus room? Why not run a day care center in the basement and back yard? Why not rent out rooms? Why not manage a Kosher catering service from the giant kitchen? The other thing that bothers non Orthodox neighbors is that the Hasidim are so numerous and geographically concentrated that they quickly come to dominate the electorate and vote themselves into positions of political authority. The public schools are defunded while municipal resources are channeled to other services valued by the Orthodox community. The non-Orthodox population cries foul and insists that the rules are being perverted and exploited by an insular clique with no regard for outsiders. But it’s the same basic arrangement the white majority has always used with ethnic minorities, except now middle class whites are on the receiving end and they don’t like it one bit. In the end it’s easier to move away than fight the Hasidic machine. The once obscure downtrodden town of Lakewood is in the process of becoming one of the largest cities in New Jersey as a result of high birth rates and an influx of Hasidic residents from older Jewish communities in places like Brooklyn. The overflow is transforming surrounding towns as well. Urban planners often talk of retrofitting the suburbs by turning dead shopping malls into lifestyle centers, but here’s a model of how the existing suburban fabric is changing by being inhabited by an entirely different subculture. 1. Very interesting to see this story covered from the “stealth urban planning” angle. 2. In contrast to the attitude you describe here, Italians and other “white ethnics” often made their peace with Orthodox Jewish communities to stand their ground in urban neighborhoods with single-family housing stock. Several still-stable areas of Brooklyn and Queens follow this pattern. The pragmatic slogan is “Better Jews/Asians than Blacks” . Lakewood has traditionally been dominated by “Yeshivish” Jews- they are ultra-Orthodox (that is, less interested in secular education than modern Orthodox Jews, and more distinctive generally) but not Hasidic. Hasidim swear allegiance to a specific sect or rebbe (unlike Yeshivish), tend to be a bit more mystical, and dress differently. Yeshivish Jews wear black hats but are less likely to wear huge furry hats (shtreimels) and are sometimes clean-shaven (unlike Hasidim). Having said that, it may be that Hasidim are starting to move into Lakewood- the people in the photo certainly look Hasidic. The photo is of a couple in Brooklyn NY, so don’t deduce anything from it. Johnny, I see you have a good understanding of Benlen? One of my favorite pop sociologists. Never heard of Benlen. What’s the connection? For the record, the Jews of Lakewood aren’t Hasidim. I suppose they all look alike to outsiders, but that doesn’t make the description correct. Are Lakewood’s Jews predominantly Lubavitcher? What would be the correct term? Is this like me confusing Protestants with Catholics, or is it more fine grained like Episcopalians vs. Presbyterians? 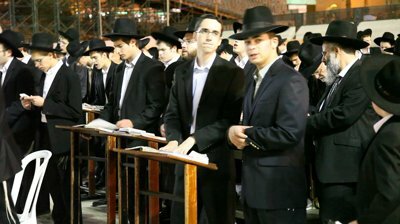 “Haredim” or “ultra-Orthodox” would be correct (more general terms than “Hasidim” which are a more specific type of ultra-Orthodox). But your overall analysis stands. And the correct description would be…? This is pretty interesting to me. I remember that there was a large Hasidic Jewish community in Rockland County, NY just north of the NJ state line. Suburbanites are always on the lookout and guard against non-conforming uses be they structural, cultural or biological. If Toms River becomes predominately Orthodox, but also has a high birth rate of children who do not attend public schools, what will happen to the town? One thing that has always fascinated me is how the densely populated NE has kept these little, affluent small towns around NYC, Boston, and Washington, places that zone homes on enormous plots of land, surrounded by woods. The newer housing that obliterated the farms and the forests, is now declining in value, because it is not near public transportation or walkable downtowns. So perhaps now it is natural that these McMansions are being sought after by large families looking for affordable housing. I need to keep these blog posts short otherwise people don’t read them, so I skip a lot of details. I grew up partly in LA, partly in Queens, and partly in Toms River. Toms River is dominated by families like mine whose great grandparents filled the tenement slums and sweatshops of New York a century ago. We’re Sicilians, Greeks, Irish, Poles, and secular Jews – what my friends and I call the “white ethnics” as opposed to the once-dominant Protestant culture of the Dutch, German, and English. Toms River exists in its current form wholly as a result of white flight after the race riots in the 1960’s. Lakewood was always the distressed “urban” town that had the only real concentration of poor black people in the county. For decades the authorities in Toms River (the county seat) did everything they could to “contain” Lakewood and its “troubled” population and to prevent tax money from drifting away from suburban communities toward the “undeserving” population of sad little Lakewood. As the Latino population of the county grew Puerto Ricans and Mexicans settled in Lakewood too since it was affordable. Again, the county authorities had no interest in brown people and just tried to keep the situation limited to an already “undesirable” location. The schools were always intentionally underfunded by the white majority. County services were never especially generous or prioritized. Now that Lakewood’s Hasidic population is seriously ramping up and spilling over into Toms River the County is about to experience a serious demographic tipping point. Folks are freaking out. What the orthodox are doing is building a new Brooklyn in the ‘burbs. It’s just a matter of time before the county government will be dominated by elected officials from Lakewood and policy shifts will reflect the values of the new majority. So be it.